1. The distress call "Mayday!" is a phonetic/anglicized spelling of the French "m'aider" = help me. I looked up the origin of the word after it was in the news recently when two Toledo firefighters were killed in the line of duty, wondering why in the world you say "mayday" when you need help. Turns out it's French, which makes so much more sense. 2. You should be careful when you flop down in the snow to make a snow angel. If it isn't deep enough, you'll bruise your tailbone. And it will still bother you several weeks later. 3. 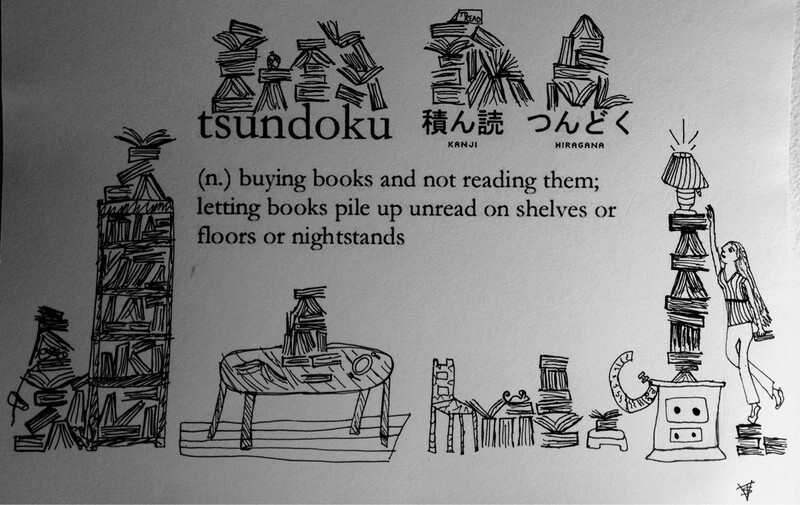 There's a word for my condition: tsundoku. 4. Whenever I read the instructions on clothing tags that say to turn the item inside out before washing, I never understood why. It's still in the same water, exposed to the same detergent. How on earth would its being inside out make any difference? Martha Stewart to the rescue: this month's issue of Martha Stewart Living explained that you turn dark colors inside out to protect the color from *abrasion*. Well, that makes a lot more sense. I don't know whether it's actually true or actually matters, but at least now I have a reasonable explanation of the logic behind the instruction. 5916. the last word He speaks over His people: "It is finished." “To be bursting with thanksgiving is a true witness of the Spirit within us. For the voice of thanksgiving speaks without ceasing of the goodness of God. It claims nothing. It sees no merit in man’s receiving but only in God’s giving. It marvels at his mercy. It is the language of joy because it need look no longer to its own resources. Your thankfulness today is directly related to your admission of how grave your plight is as a sinner. Self-righteousness crushes gratitude. 5874. "soup from bones...a very practical act of redemption"
5895. Elijah's first loose tooth! Based on the title/subtitle and the back blurb, I was anticipating something vaguely One Thousand Gifts-ish. The introduction and the last essay (also titled “Cold Tangerines”) were exactly in line with what I expected, but everything in between went a totally different direction. The book is essentially memoir, set apart from your typical memoir by its format (a collection of stand-alone essays). But the essays aren’t so much about ordinary things like “cold tangerines”; many of them are about monumental life experiences. Whew. Lots of wonderful, provocative quotes...but his style is SO rambly and meandering that I had difficulty pressing through at times. I lost count of how many times I clapped my hand over my mouth in horror while reading this. Just stunning. Yet the authors were careful to make it not merely a litany of horrors, but to offer hope and solutions alongside the suffering. It was challenging to learn about the problems women face worldwide (never have I been so grateful to have been born in the United States) but inspiring and beautiful to hear about how women themselves are stepping up and solving those problems. I also think it's helpful to re-frame this stuff as not a women's issue or a feminism issue, but a human rights issue. I did mark some things I wasn't sure I agreed with, or things to go back and chew on. I found it ironic that the authors often highlighted the ineffectiveness of government/UN initiatives as compared with those of "social entrepreneurs," yet suggested toward the end of the book that the U.S. should throw $10+ billion at these problems. Not that I don't think that would be a better use of tax dollars than many of the ways we currently spend...but seriously, where is that money coming from, and why waste the funds by channeling them through the government when the evidence indicates private individuals and organizations can do a far better job? Whatever... At any rate, definitely a worthwhile read. I don't think the subtitle actually captures the heart of this book. It's less about "when life is unsatisfying and awful" and more about "when life is wonderful but not quite enough and your heart still aches for more" or "when life is bittersweet." That said, I do enjoy the author. Her writing is appealing--vivid, warm, vulnerable, truth-telling. Probably 3.5 stars. I was sure I was going to love this—the first 25% was probably five-star. But after the account of the author's background and her conversion, I ended up disappointed. I felt like she made the leap from "former lesbian feminist professor, reluctant/resentful convert" to "homeschooling pastor's wife" too quickly in the narrative. I would have liked to read more about *how* she transitioned into this new life. How did she lose the job at Syracuse? How did her relationship with her pastor-husband develop? What became of her relationships in the gay community that were initially strained but still important to her early on? How did her faith in Jesus transform from resenting His meddling in her life, to actually embracing faith in Him and feeling joyful about it? Meanwhile, instead of really delving into these things, she spent an inordinate amount of time on peripheral matters of doctrine, which I found unhelpful, unnecessary and off-putting. The parts about her experience as a foster parent and adoptive mother were inspiring, but the story arc as a whole felt sort of jarring, with too many missing pieces. I still think she has valuable insights to offer the church, especially with regard to evangelism and community. Hers is a unique perspective as both "outsider" and "insider," and the church would do well to take seriously her sharp, poignant critiques. But in the end, I was dissatisfied that this book fell short of what it easily could have been. This was very different from the (many) other books I have read about the 1994 Rwanda genocide. Written within a year after the fact by a BBC journalist who traveled in the country while the killings were still happening, its first-person observations and reflections have a feel of immediacy that makes the horrors palpable. The prologue also provides a valuable analysis of Rwandan history that led to this tragedy. Keane writes maddeningly about the killers and the injustice of their being sheltered and fed in refugee camps instead of prosecuted. He also gives calmly scathing indictments of the international community's both refusing to get involved and meddling in unjust ways. It's a personal and penetrating account that has a valuable place in the canon for this topic. This should have been about half its current length--and I say that as one who does not get easily bored with nonfiction books, though I know many people find them to be needlessly repetitive. Apparently the author has gotten a TON of resistance to this topic, because he kept repeating argument after argument about why affirmation is necessary, how it's rooted in Scripture, how to mitigate the pitfalls, etc. He has a strong case, and I was convinced early on--so the more he kept anticipating and answering objections, the more annoyed I got. "I believe you! Let's get on with it!" It took SO long to get to the practical stuff that I tossed the book aside for a while before coming back to finish. Words of affirmation is my #1 "love language," so of course the book resonated deeply with me, but I have to say I was curious about whether those who do not share that "love language" would find it as compelling or persuasive. Of course, the "love languages" concept is not rooted in Scripture (it's not anti-biblical, per se, just not drawn from the Bible) whereas this book definitely is. Still, I found myself wondering how others would respond. In that vein, I was surprised that at the end, in the list of 100 ideas for affirming people, many tips were listed that were not verbal affirmation, but would rather fall under other "love languages" like acts of service or quality time. This felt a little surprising since I don't remember the author really defining "affirmation" that broadly earlier in the book; the rest seemed focused mainly on words, and then these non-verbal ideas for "affirming" seemed to come out of nowhere and didn't seem to fit with the main thesis, however wise and helpful they might be. After reading, I did feel challenged and inspired to notice God's grace at work in those around me and point it out to them, encourage them--which was the main goal. I don't really have any problems with what he said, just how many times he kept saying it. I kept reading because I was curious what happened (the first chapter jumps right into the action, so it was pretty intriguing). But OH MY GOODNESS THE WRITING. My inner editor was doing a facepalm every other paragraph. Her example of forgiveness was admirable and inspiring, but the story was so incredibly melodramatic and poorly told. I can't recommend this highly enough. I have recently become captivated with the idea that the most seemingly-ordinary people have extraordinary stories to tell, and personal experience is quickly teaching me that listening to people tell their stories really *is* an act of love. StoryCorps is about "the eloquence, power, grace and poetry in the words of everyday people; the notion that the lives of the people we pass walking down the street can be as compelling--even more compelling--than those of the rich and famous." I found these stories charming, deeply moving, stunning, heartbreaking, heartwarming, delightful. And I felt even more inspired to hear and preserve the beautiful stories of the not-so-ordinary people in my life. Fascinating at first, but I got bored with this as it went on. It was intriguing, and I did finish, but I also think it desperately needs an update. Written in 2000, it doesn't account for social media at all, which I think have had a HUGE impact on word-of-mouth "epidemics" and the interactions between Connectors, Mavens and Salesmen. I'd definitely be interested in hearing Gladwell's analysis of how things like Facebook and Twitter and blogs--none of which were really around when this was published--affect the things he wrote about here. If I had to describe this in one word I think I’d say “quaint.” It wasn’t particularly well-written or moving, nor was it particularly bad. A sweet, sad story about a significant American experience. I found myself frequently skeptical because of the way it was a biography written as a novel. Other narrative nonfiction (at least the stuff I’ve read) tends to use less quotations and be really scrupulous about the facts…this seemed like the author (the daughter of the main character) had to do a whole lot of embellishing given the way she described scenes with great detail, recounted conversations, etc. WHEW do I ever have a lot of thoughts about this. I made scores of margin notes. Going to take a while to sort through the tangle and write a careful review (which I have to do soon because I got a copy from NetGalley). A powerful, compelling book. I especially liked hearing this as an audiobook, because listening to the whites in the book say such appalling things out loud really drove home the impact of the discrimination the blacks experienced. It is sickening to think America was like this during my parents' lifetime--just stunning. I think the author contributed something incredibly valuable to the civil rights movement by physically bridging the chasm between blacks and whites during the late 1950s. There was SO much great stuff to love and learn in this book. But there were also a great deal of troubling presuppositions about people's hearts and motivations. I found the author's fundamental teaching about the human heart to be deeply flawed and not rooted in Scripture. If you are willing and able to separate the wheat from the chaff, this is *absolutely* a book worth reading for marriage and for parenting. I did a lot of underlining and I definitely want to go back over it and review my notes. But I would strongly urge reading with careful discernment and an eye to what Scripture actually teaches about the sinful nature, the basic posture of the human heart, and people's "needs." Those disagreements I had with the author are what make it a 3 (3.5 probably) star book rather than the 4 or even 5 it easily could have been. Classic Piper, challenging and God-exalting and rich with beautiful truth. I made a second pass through this penetrating book about the fear of man, skipping the theoretical/foundational part one, which I already understood and bought into, in favor of the more concrete and practical second half. It was excellent to revisit. I am consistently helped and encouraged by Welch's biblical insights. I was curious to learn about this philosophy of education, since so many I know speak highly of CM--but talk about overwhelming. It had more dots on my Kindle than the Bible. I set it aside as I found it mostly guilt-inducing and discouraging for how idealistic and unrealistic her assertions seemed. A book to dip in and out of more than a book to read straight through. I'll probably come back to it, but I do think I like Bragg's memoirs better. BO-ring. I was expecting more analysis of the cultural/societal/governmental elements that led up to World War I...instead I got buried in detailed military strategy and analysis. Which might be your cup of tea; it just isn't mine. I read a lot more nonfiction than fiction, and this list doesn't break down nicely into "spiritual growth books" and "secular books," so I'll post the first half today and leave the rest for tomorrow. The three nonfiction books that stuck with me most this year were Listening is an Act of Love: A Celebration of American Life from the StoryCorps Project; The Child Catchers: Rescue, Trafficking, and the New Gospel of Adoption, and One to One Bible Reading: A Simple Guide for Every Christian. I need to read more biographies/memoirs of notable Christians, and I've long been awed by Joni's faith and witness in the midst of profound, lifelong suffering. A beautiful testimony to the sustaining grace and faithfulness of God in the life of a beautiful woman. A lovely memoir with lots of eloquent quotes. Meh. I didn't enjoy this nearly as much as The Devil in the White City. It was too slow, too much buildup and background. For the first half or more of the book, Larson closed every chapter (sometimes every section of a chapter) with a line like "This would prove to be very significant" or "Later events would show how much such and such mattered." It got irritating after a while--stop telling me something important is coming, and just GET THERE. I was engaged and wanted to keep reading, especially toward the end, but it took too long for the separate stories to converge, and the detailed information about Marconi and wireless telegraphy wasn't nearly as interesting (or as understandable) as the information about Burnham and architecture in The Devil in the White City. So, the book was intriguing, but not awesome. An encouraging, important contrast to the "public schools are of the devil!" perspective so prevalent in Christian circles. It was inspiring and helpful to hear from these parents who have sent eight kids through the public schools (and their oldest few are grown, successful, still faithful to God, and thriving). Epic indeed, and sorely disappointing. McCullough is supposed to be amazing, but I wasn't impressed with his style. Dry, too many details, and yet still hard for me to visualize processes and structures he described. I just was BORED most of the time; even though I love NYC and this period of history, I had to force myself to finish this 600+ page clunker. I officially love Kathy as much as her husband after devouring this little booklet. It deserves to be widely read, especially among conservative, complementarian Christians. Sadly, I did not love this first memoir from a college acquaintance of mine. I disagreed with many of her interpretations of life and theology, and I also felt like it needed better editing. I really wanted to love this. I think the fact that I found it a bit saccharine and over-earnest says a lot more about cynical me than about Katie or the book. I do think I would have liked it better if I hadn't listened to the audio version. The narrator's voice struck me as kind of syrupy. Also, the print edition has a *hugely* important afterword. Before I read the book, I read some sharp criticism of Katie--especially regarding her devastation at one of her "daughters" being reclaimed by the birth mother. Listening to the book, I could certainly understand that criticism and found Katie's words troubling--immature at best. But in the afterword to the updated print edition, she tells "the rest of the story"--about a relationship that developed between her and the birth mother and how she came to realize that God in His goodness, wisdom and sovereignty was up to beautiful things in the whole situation and that "it is better this way." 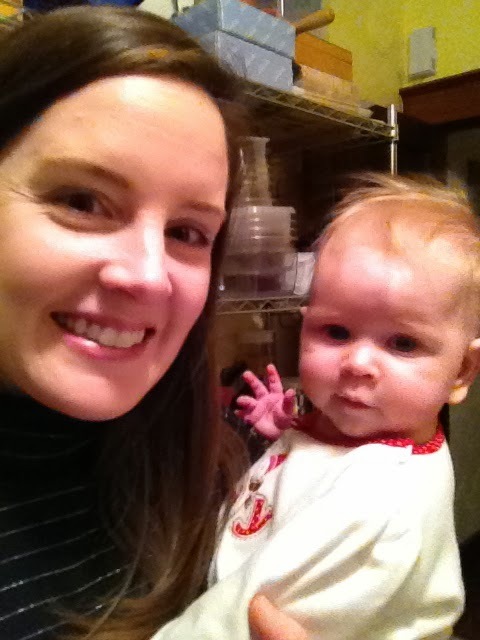 That went a long way in redeeming my view of Katie and her ministry. This was so very depressing and hard to read—but as the culture of adoption continues to grow in the church, I think it’s a critical book for Christians to read and consider. Ignorance may be bliss sometimes, but we cannot continue in our misinformation and naivete. My eyes have been opened to the dark underbelly of the adoption world, its heartbreak, its unintended consequences. It's not that I'm against adoption now, but there are *massively* complicated issues to think through, and whether you agree with Joyce's every word or not (she is not a Christian, and her words about the church must be sifted) she does a masterful job exposing these problems. I've been wanting to do a whole post about this book and the topic in general...hopefully soon. After nearly setting it aside for lack of time (a friend had loaned it unsolicited; my to-read list is long enough without additions like this! ), I picked up this charming little book on a whim and blew through it in a day and a half. Part of its charm is the way it offers just a tiny sliver of the author's life--there is so much you learn about her and her correspondents, and yet so very much that remains mysterious. You wouldn't expect a collection of letters to be suspenseful, but it is: How old is this woman? Will she ever make it to London to meet her newfound friends in person? Delightful. And it was nice to breeze through a short and light book that could be finished in just an hour or two. I mostly agree with this extensive review. I found much to appreciate and learn from in this book, but also some frustrations/concerns. Still it was quite helpful to read through and discuss with my pastor and a couple of other women at our church. I've never felt motivated before to read a cookbook cover-to-cover, but I had to for my favorite food blogger's debut. I adore Deb. Her writing is witty, interesting, fun; her photography is gorgeous. So it's enjoyable just to read and look at her recipes, but cooking them is enjoyable too. I've generally found her recipes easy to follow and we have loved many of them over the last several years. Ironically, I'll probably attempt less than half of the recipes in the book, and I've been less than thrilled with a couple I made--but I still look forward to many more and don't regret the purchase. A great little book that left me going "DUH! *Why* are we not doing this?" It's so simple as to seem obvious, and yet (in my experience) it really isn't happening in the church at large. People--whether unbelievers, new believers, or established, committed Christians, don't primarily need events, programs and classes (though those things can certainly be helpful at times). They need to be in the Word, and they need real, deep relationships. This book and its resources (an appendix of clear, straightforward worksheets to help you think through any passage of Scripture) offer a great strategy for benefitting from God's Word and fellowship anytime, with all kinds of people. I've enjoyed putting this into practice and also teaching it to the women of our church last fall. On the whole, a helpful book. I didn't love the author's style/sense of humor; it came across a bit cheesy, like he was trying too hard to be conversational and funny. Still, he had valuable things to say. I copied/underlined several quotes and passages. Very God-centered and hope-filled--I wouldn't hesitate to recommend this to someone who was struggling with contentment, dissatisfaction, jealousy, etc. A powerful, compelling testimony of courage, humility, and hope in the gospel. Hill identifies himself in the unique position of a gay Christian who believes acting on his homosexual desires would be wrong. He did not choose his orientation and has not been "healed," nor does he seek to interpret Scripture in such a way as to justify or embrace homosexuality. Instead he chooses the painful and rare path of celibacy as he seeks to walk with Jesus through this broken world. It's a beneficial book not only for thinking through the issue of homosexuality, but also for gleaning truth and glimpsing grace as a fellow sinner writes candidly about his struggles. (In other words, while I don't struggle in the same ways as the author, I was easily able to apply things he said to my own life and struggles.) This is a book that makes much of God and His glory and mercy. The first third of this was probably 4.5-5 stars. I underlined lots and lots of passages--really insightful, penetrating thoughts about fighting against sin and walking faithfully with Christ. But it got so, so repetitive that I had a hard time finishing. The middle-to-latter parts seemed less relevant/helpful. At any rate, I think it's good for me to read old books like this instead of exclusively immersing myself in relatively current books. I'd definitely recommend this one, just not necessarily *all* of it. More tomorrow. Meanwhile, what nonfiction did you read and love in 2013? This was the year of venturing back into the glorious world of juvenile fiction. Elijah and I have transitioned into mostly chapter books with a few picture books sprinkled in--and it is so fun to both revisit childhood classics with him and discover new favorites together. So most of my fiction reading this year was for the younger crowd, but I did have a couple of fantastic adult reads sprinkled in. I hope to read more adult novels (including at least one classic, argh!) in 2014. My favorite novel in 2013 was The Language of Flowers by Vanessa Diffenbaugh. Tied for a close second were two novels by an author whom friends of mine have recommended for years, but I just now discovered: Kate Morton. I absolutely adored The Secret Keeper and The Forgotten Garden. To quote another writer I discovered this year, I am treating Morton's books like chocolate: "I am always greedy for more, but I’m desperately concerned I’ll run out." Is there anyone who doesn't adore Anne Shirley? If so, I don't want to know her. These books are perhaps my most beloved ever--they are certainly my most-read. I returned to them when I had the flu last January, and despite the fact that I have been through them so many times I practically have the stories memorized, I still can't bear to put them down once I've picked them up. Anne is an old friend that I find more endearing the more familiar she becomes. An endearing story. I had fun attempting different voices for all the different animals. The first half was kind of quirky and charming. Stuart is not a member of a mouse family, as I assumed; he is a mouse inexplicably born to a human family. Each of the early chapters is sort of a stand-alone story about his adventures as a mouse living in a human world, and Elijah and I enjoyed these. But then it changes to one extended plot about Stuart on a quest. The chapters got too long to read in one sitting at bedtime, and bogged down with description. And the ending was terrible--unresolved, unsatisfying; it didn't seem apropos for a children's book. Elijah really enjoyed this. A sweet, entertaining story with likable characters (including Beezus and Ramona Quimby). This was the first Roald Dahl I've read since I was a kid...I didn't love it as much as I remembered. Fun, fantastical, an engaging story (and the short chapters make it perfect for a read-aloud) and Elijah liked it...but not a favorite, and not one we'll bother reading a second time. Charming stories, and Stockard Channing's performances are really excellent. I remember reading the stories as a child, but I'd never heard the audio version and hadn't read/heard the stories as an adult. I found myself smiling a lot and even laughing out loud, and Elijah was totally enthralled (four hours of total silence in the car). I discovered upon picking up the printed copy of Ramona the Pest that the chapters are a bit long for read-aloud times with my young boys, and I much prefer Stockard Channing's voices over my own (how can she come up with SO many distinct human female voices?!) --so I definitely recommend the audiobook versions for long road trips vs. sitting down with the books. WOW. Brilliant. Did not see the ending coming at all! The writing was lovely and wonderful and the story had one intriguing, enthralling twist after another. A fun read. Not my favorite ever, but Elijah (and Jude) and I enjoyed it. The marriage/family dynamics were definitely odd...but whatever. 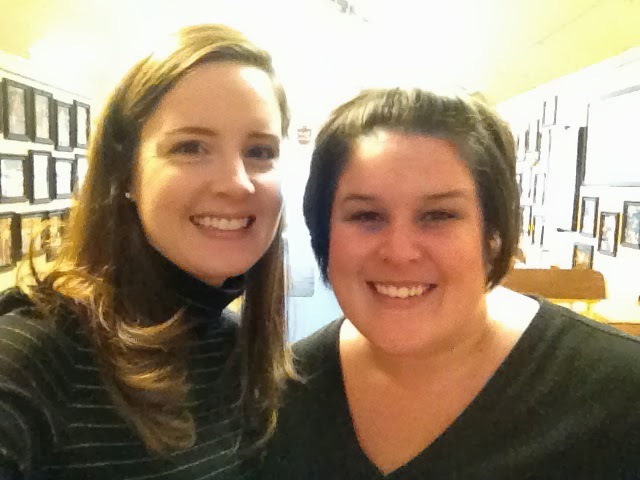 Man, I love Kate Morton! Could not put this down. It was very similar in style to The Secret Keeper--an old woman's mystery, unraveled over the course of more than a century, solved in the end by one of her descendants. Lots of twists and turns on the way to an unexpected but satisfying ending. And the writing is vivid, lovely--I absolutely loved it. The story, which I’ve heard/read several times, is five stars, but the audio version gets about three. The volume fluctuated WAY too much, making it really annoying for in-car listening: You'd have to turn the speakers up as high as they go while the narrator was mumbling quietly through narration, then all of a sudden someone talks excitedly and your eardrums get blasted. I also just wasn't overly impressed by the reader--though maybe I am just biased because I've heard the Radio Theatre version of this, which is more enjoyable. 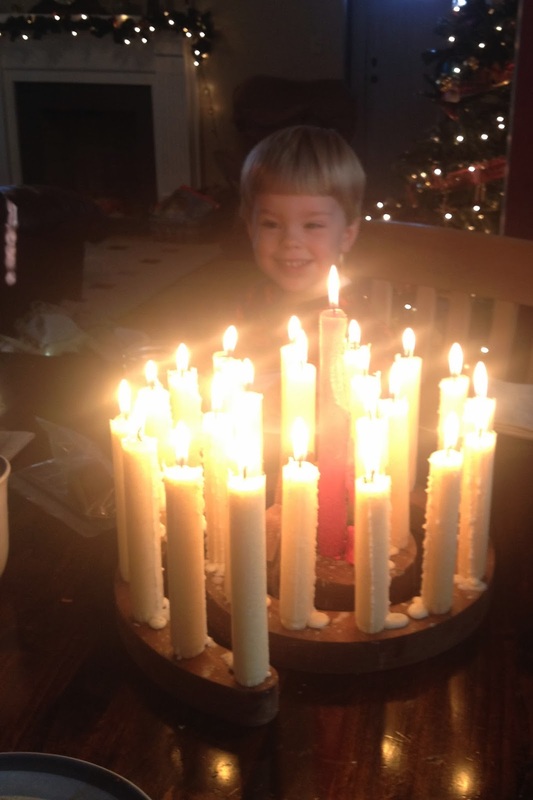 At any rate, this was Elijah's first trip through Narnia, and he was enthralled. It feels heretical to admit this, but I really did not enjoy this classic. Elijah seemed to enjoy it, but I'm not entirely sure why. You know how some books are written for kids, but also written with adults' enjoyment in mind, with jokes that go over the kids' heads? This felt like it was written mainly for adults' amusement, with almost everything going over the kids' heads. And I wasn't even amused, not like I am with other children's books. It just felt too...smug, or something. It's hard to describe, but suffice to say I wasn't a fan. I tried to read this years ago and couldn't get into it. Then I saw Tim Challies recommend the audio version, so I gave it another shot. I was definitely better able to enjoy listening. The narrator is an older man with a soothing, pleasant voice, and that helps it feel more like a letter an elderly father is writing to his young son (which is what the novel is). For a while the book was just meandering—lovely, but meandering—then it got surprisingly suspenseful in the middle. A few times I had to pause it to scribble down a really beautiful or profound quote. In the end I did enjoy it, but it wasn't my favorite. I think mainly it's a case of "not really my style." I liked the narrator for this much better than for The Lion, the Witch and the Wardrobe. And we all enjoyed the story. This book absolutely wrecked me. I don't know when I have ever so desperately pleaded for a happy ending. The intimate look inside the mind and heart of Victoria, a girl who is "emancipated" from the foster care system on her 18th birthday, is gripping and devastating. Victoria sabotages every good thing that happens to her, and I found myself gasping, clapping my hand over my mouth, crying, shaking my head...yet totally seeing why she would think and feel the way she did. Oh, it was heart wrenching. The "hook" of the hidden meanings of flowers adds such richness and depth to the story, and the chapters alternate powerfully between Victoria's past experiences in foster care and her present struggle to establish a life for herself. The characters are believable people you want to root for. A masterpiece. I didn’t love this as a read-aloud. I remember enjoying the series as a kid, but this one, at least, is SO very descriptive that I think it is probably more enjoyable to read to myself because I can read so much faster silently than I can read aloud. Still, Elijah enjoyed it--enough to want to move immediately into book two. I enjoyed this as a read-aloud much more than Little House in the Big Woods. I have to say, though, that as a parent reading this to my child, I have a very different perspective than when I read these books as a child. The time and culture in which they were written are so very different from our own, and two main things I found repeatedly troubling: the parents' shaming attitude toward any display of emotion whatsoever, and the racism. To be fair, Pa is repeatedly painted as a sympathetic character to the Indians, drawn in sharp contrast to Ma and the neighbors. But still, it is so sad to see and hear the white settlers' thinking and treatment of the Native Americans whose land they forcibly took--I had a lot of explaining to do, so that my son wouldn't come away thinking the events and conversations the book described were OK. And say what you will in nostalgic remembrance of "a better time" when children were taught obedience and respect...I do *not* want my children to learn that crying is shameful, that adults are more important than children, etc. The book was peppered with little comments that conveyed these lessons and others like them. Despite these hang-ups, I still think it's an engaging story and an important firsthand account of American history. I think this one is my least favorite of the Narnia books. I found it hard to listen and focus--zoned out/fell asleep more than once. And Elijah wasn't interested at all, surprisingly. Not terrible—I’m always deeply moved by the profound spiritual truths Lewis can weave into fantastical fiction—it just wasn’t as delightful as the others. The first story left me with that familiar but uncomfortable "I feel like this was super profound but most of it must have gone over my head" sensation. Then I found out you're not supposed to start with her most famous stories. At the advice of an O'Connor scholar I skipped to "Revelation," which was OK, and then "The Enduring Chill," which I can't say I enjoyed. After one more, I gave up. I like Flannery's nonfiction *way* better than her fiction, which I won't be reading any more of unless I first get my hands on one of the books that explains it (which I'm not highly motivated to do). I think I'm just not really a short-story kind of girl. The first three in this collection left me totally nonplussed (and feeling slightly stupid). I hung in there for one more story and it ended with the character committing suicide! I don't think I've ever found a short story or a collection of short stories I really loved. Just not my genre. Doing all things without grumbling is humanly impossible. But thankfully not with God (Mark 10:27). What it requires is getting our eyes off ourselves and onto Jesus (Hebrews 12:2) and all God promises to be for us in him. It requires seeing grace. Being different comes from seeing differently. Yes it is hard. It’s a fight. God told us it would be that way (1 Timothy 6:12). But we will grow in the gracious habit of cultivating gratitude through the rigorous exercise of constant practice (Hebrews 5:14) of seeing grace. Lord, help us speak more in the accent of heaven! 5943. a book I wanted for Christmas (N.D. Wilson's Death by Living) on Kindle-sale for $3.99 - and Amazon gift cards to pay for it! 5950. my brother getting engaged! 1. I am a little bit obsessed with the Reminder function on my iPhone. I am a list girl, and I *love* that I can not only jot down a note to remind myself, but I can actually have my phone ding to remind me on the day or at the time when I need to do it! 2. Four words: Cranberry Cinnamon Honey Butter. 3. If you don't know what an acronym stands for, don't make an assumption or disregard it as irrelevant. ASK. If you see "Science Fair and PTF" on your kindergartner's school calendar at the beginning of the year, and you don't bother to ask the teacher for clarification, you might end up making plans on the night of your son's Christmas program. Because apparently "PTF" means "Christmas concert," and you won't get any other notice that a Christmas program is in the works until about ten days before the fact. Related lessons: Don't be afraid to call and ask people for undeserved favors (the Nashville Symphony was kind enough to let us trade our Messiah tickets for another night). And if you are the one distributing information, avoid acronyms unless they are obvious and make your info as clear as possible. Sure, you've always done it this way every year and everyone knows that...everyone, that is, but the new parents/new members/new kids. 4. A Christmas gift for teachers that will be extremely well received, if you can pull off the logistics, is a container of homemade soup and a loaf of bread. 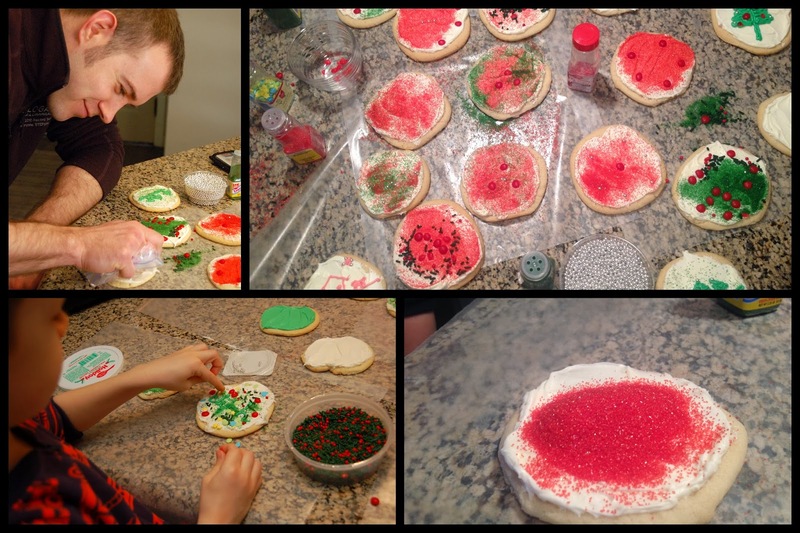 Every December, I always want to do a bunch of Christmas baking, but the problem is, EVERYONE does a bunch of Christmas baking. Often that means people end up with piles and piles of cookie plates, candy tins, and other assorted goodies they definitely don't need and may not even want. This year it occurred to me--why not give the boys' teachers a meal, like I would take to a new mom? They're busy women with families and I'm sure it would be a blessing to have a night off from cooking after a long day at work (especially after the exhausting last-day-before-Christmas-vacation). I made this soup and a loaf of artisan bread to go with the small gift we got for them; both the boys' teachers seemed really appreciative. 5. Speaking of teachers and Christmas break...kindergarten teachers do NOT get paid enough. I went to Elijah's school for an hour and a half to help with his Christmas party and when I got home I needed a nap. Those kids were higher than kites on sugar and holiday excitement. I already knew teachers worked really hard, but this reinforced my respect and gratitude. 7. The reindeer names "Donner" and "Blitzen" are German for "Thunder" and "Lightning." That one was a bit of New Year's Eve trivia courtesy of my brother-in-law's German-major girlfriend. 8. Gin is made from juniper berries. Another random, useless piece of NYE trivia. 9. For all my husband's love for strategy games and claiming he's not a words guy, he's awfully good at Taboo. How about you--what did you learn last month?